Case reports are open to selection bias and there are no reported data on the frequency and severity of AFD manifestations in a large cohort of carriers. Women are not usually evaluated in the clinic unless they present with serious AFD complications, but they do attend for genetic counselling when their son or male relative is diagnosed with the disease. During regular reviews of AFD families in the genetic clinic, we have observed multiple and more frequent AFD manifestations in female carriers than expected. Owing to the lack of clinical data and present health care policy, we were unable to perform clinical investigations. Therefore, a large cohort study using an AFD specific questionnaire was performed to establish the mortality and the frequency of all AFD manifestations in obligate carrier females. All known (n=80) obligate carrier females, who were over the age of 18 and had demographic data recorded in the AFD register, were asked to participate in this study. Sixty (75%) agreed and provided data; non-responders were reminded on one occasion. Some participants did not complete all measures, so the exact number is reported for each result. Local ethical committee approval was obtained at the start of the study. Obligate carriers included were those who have at least one first degree relative known to us, and who were able to give information on the diagnosis and cause of death or provide a death certificate. Carriers for AFD were assessed in the genetic clinic, following the diagnosis of AFD in their family, or following incidental findings of cornea verticillata or angiokeratoma in a female without a previous family history of the disease. The AFD specific questionnaire was thus created, based on in depth interviews with patients and medical practitioners. (The text of this questionnaire is available electronically on request.) In the questionnaire, the obligate carrier status was first confirmed by a statement that the woman had/has an affected father or brother or has an affected son. The questionnaire contained questions on general health and the presence or absence of manifestations of the disease as is seen in affected males. The character and nature of neuropathic pains were clearly explained and direct responses requested as to the onset of pain, medication, and its effect on everyday life. The McGill Pain Questionnaire (short form)4 was further adapted for carriers by selecting the following: the intensity of the pain on average during an attack on a scale of 0 = no pain to 10 = pain as bad as you can imagine, the presence and intensity of background pain on average, its location, and effect on attendance at school, work, social activities, and participation at sports (scale 0-10). Further, women were asked direct questions: have you ever suffered a stroke and have you ever experienced a weakness (in your arm, leg, or face) or double vision lasting only minutes/hours? We have followed all reported TIA and CVA by a phone call to these women and to their general practitioners to obtain a detailed history. Information on renal function was obtained by asking whether any blood and urine test was done in the last year, whether it was normal, is the woman under assessment by a renal unit, is on renal dialysis, or had renal transplant. For heart function, a direct question was asked about chest pain/palpitations and results of tests performed in the last year. Next, women were asked to respond yes/no to specific questions on the presence of manifestations of AFD, which included “Fabry rash” (angiokeratoma), sweating, tinnitus, exhaustion, gastrointestinal symptoms, and others. X linked inheritance and the understanding of AFD transmission was assessed simply by asking whether an affected father can pass on the genetic mutation to his son or to his daughter and, similarly, what were the chances of transmission of the disease by a carrier mother. 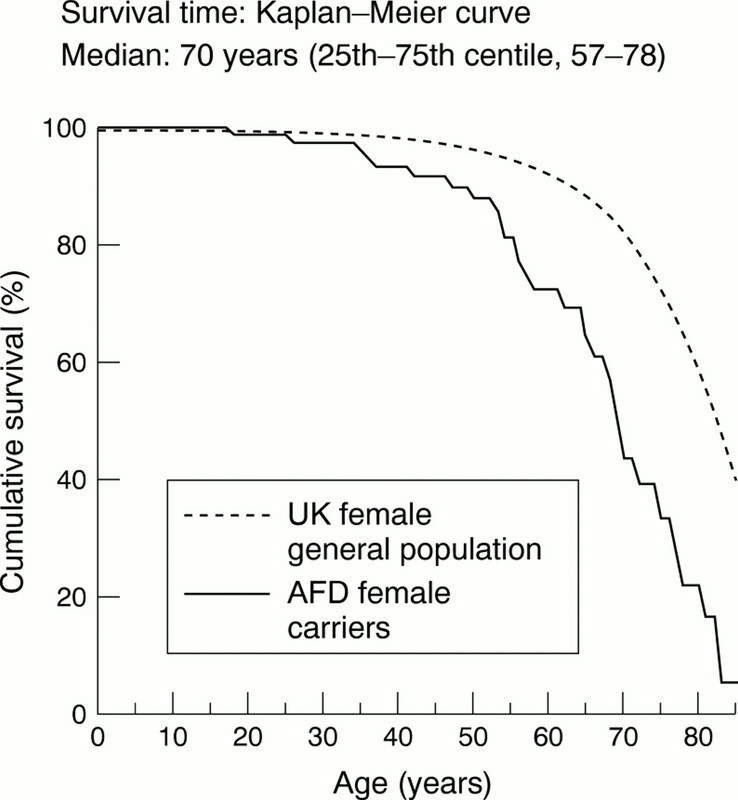 The cumulative probability of death for AFD female carriers was calculated using the Kaplan-Meier survival method and current data on the UK female general population was provided by the UK Government Actuaries Department using 1997-1999 life tables. The survival function in fig 1 shows the median cumulative survival to be 70 years, which represents an approximate reduction of 15 years from the general population. A gradual decline of the AFD female carrier curve is evident from the age of 35. Six of these 32 women had renal failure, of whom half have had a renal transplant and two have died of lymphoma following immunosuppression for renal transplantation. Results of renal biopsy were not available, as all these women presented with end stage renal failure (ESRF). A total of 15.6% (5/32) had mitral valve replacement and cardiomyopathy, 28% (9/32) died of cerebrovascular accidents (CVAs), often multiple, aged between 56 and 83 years, and four died of cancer. Cumulative probability of death for AFD female carriers calculated using the Kaplan-Meier survival method. The survival function shows the median cumulative survival to be 70 years, which represents an approximate reduction of 15 years from the general population. A gradual decline of the AFD female carrier curve is evident from the age of 35. The prevalence of AFD carriers is 1 in 339 000 females in the UK. The AFD register contains data on 67 families with AFD of whom 47 had a family history of the disease and 20 affected males did not. In half of these, carrier status in their mother was confirmed by clinical examination, leucocyte, and hair root α-galactosidase estimations, and subsequently by mutation analysis. In the remaining males, the origin of the new mutation is at present unknown. The register contains data on 89 obligate and manifesting carriers and 40 female first degree relatives, whose carrier status is at present unknown. The cohort examined in this study consisted of 60 obligate carrier females, mean age 44.9 years (95% CI 41.01, 48.79). Past medical history included the following: bronchitis in 31.7%, hypertension in 31.7%, and heart attack, angina, or heart failure in 16.7%; a further 3.3% were treated for breast cancer and 5% were given a diagnosis of rheumatic fever in the past. None had diabetes. Multiple serious or debilitating complications of the disease were documented in affected males, but were not expected in carrier women. In 30% (20 women), multiple and serious manifestations were present (table 1). These are illustrated by the following case histories. A 37 year old carrier presented with ESRF and has attacks of diplopia and severe peripheral neuropathic pains. Unusually severe AFD symptoms, even for a hemizygous male, were observed in a young girl aged 17. She was confined to bed for three months during her last year at school with severe incapacitating peripheral neuropathic and muscle pains and extreme exhaustion. Following home tuition, she was able to complete a university course and obtain a job. At her present age of 26, her pain control has been obtained with high doses of Gabapentine, Amitryptiline, and Solpadeine. However, she is unable to travel to work or carry out her desk job because of extreme fatigue, myalgia, and acute attacks of pain. Another 36 year old carrier appears to suffer from a personality disorder and has severe attacks of pain requiring treatment with morphine. In childhood, the nature of her pains were not recognised and she was under psychiatric care for many years, until her father developed renal failure and the diagnosis was made. Seventy percent (n=60) of carriers have experienced some form of neuropathic pain (n=42) and 30% have not (n=18). Of the total number of AFD carriers who reported experiencing pain, 42 (80%) said that the pain had never stopped since onset. However, in 10 carriers (20%) the pain did stop, at a mean age of 28.8 (95% CI 17.3, 40.3). Of the 42 carriers with pain, 41 women had pain attacks during pyrexial illness or in hot weather, of whom 19 also had continuous background pain in between attacks. Only one woman experienced continuous pain alone. The mean pain score for pain intensity during an attack was 7.4 (scale 0-10) and for background pain was 6.8. A total of 17.1% were taking anticonvulsants and/or opiates. Over half of the remainder took non-steroidal anti-inflammatory drugs regularly. The commonest pain location in women carriers for AFD were the hands and feet, followed by the large joints of the upper and lower limbs. A total of 27.5% (n=29) stated that the pain affected their attendance at school (mean score of 8, McGill questionnaire), in 55.5% (n=28) it affected participation in sports (mean score 8.6), it affected family life in 27.5% (mean score 6.6), and social activities in 46.6% (mean score 6.5). These results suggest that neuropathic pain is a significant manifestation of AFD in a high proportion of carrier females. Table 2 shows the onset and table 3 shows the frequency of AFD disease specific manifestations in carriers >18 years. The response to the questionnaire was complete in this cohort; however, data on renal and cardiac function are approximate for frequency in carriers as only a third of the women were investigated. Twenty-three women stated that they had experienced at least one TIA. Table 4 shows the signs and symptoms in 17 carriers in whom TIA was considered likely; a further three women were excluded and three remained unknown. Four women with CVA have also recorded a previous history of TIAs. Renal function was assessed in only 31.5% of carriers in the last year. Two women are receiving renal dialysis at a mean age 36, of whom one has presented with ESRF. None of the respondents has had renal transplant. Cardiac function was assessed in only 35.6% in the last year, but 52.5% have reported chest pains and/or palpitations and ankle swelling; 16.9% of women had abnormal test results (table 3). GI symptoms were commonly recorded; over half of the respondents complained of bloatedness, indigestion, and abdominal cramps. Diarrhoea and constipation were present in over 40% and vomiting in 14%. No additional diagnosis of bowel disease was reported by these women. The symptoms are suggestive of being the manifestation of AFD, but the results of GI investigations are required to confirm these findings. The frequency of angiokeratoma is most likely an underestimate, as on clinical examination several carriers in this cohort had sparse lesions, in the form of diffuse tortuous capillaries on the upper chest or patches of angiokeratoma in dermatome distribution on the upper or lower limbs. In this cohort, hypohidrosis was reported by 32.8% as an inability to sweat on exertion, during sport sessions, and when pyrexial. The triad of hypohidrosis, overheating, and mild peripheral pains was used by the women as diagnostic of their carrier status. Tinnitus was reported by 25%, in the form of unpleasant attacks, usually lasting seconds or minutes, often associated with dizziness. Disabling joint and muscle pains, diagnosed as fibromyalgia were present in five carriers (7%) aged between 45 and 55 years. They have severely reduced mobility, experience constant pain, and are unable to work. One woman presented with polyarteritis nodosa-like symptoms and with proteinuria. One carrier presented with muscle pains and localised proximal muscle atrophy in the lower limb and neurological investigations failed to identify the cause. The majority of carriers (66%, n=59) rated the AFD information given at diagnosis as excellent or satisfactory and 44% rated it as poor. Genetic counselling was evenly divided between poor and satisfactory. Routine medical assessment is not being carried out in two-thirds of women. Responses are shown in fig 2. Reproductive decisions taken by AFD carrier women who had children after 1980. TOP=termination of pregnancy. About a third of the sample reported being happy, full of life, and energetic. Another third admitted to being depressed, anxious, tired, and frustrated some of the time; 15.8% were tired all the time, 5.7% were frustrated, and 5.4% were suicidal most/all of the time. Personal needs summary listed the following: education of medical practitioners about clinical manifestations of AFD, improvement in genetic counselling, access to ERT trials information with implications for treatment in carriers and young males affected with AFD, regular monitoring for heart and kidney problems, and medical management with more understanding and sympathy. This is the first report of a large cross sectional cohort survey in adult obligate carriers for AFD. Included were all obligate carriers known to the UK AFD register with confirmed pedigree structure and AFD diagnosis. Those under the age of 18 were excluded as published reports and clinical observation suggested mainly adult onset of AFD complications. The data are based on an AFD specific questionnaire survey for self reported signs and symptoms, and on clinical findings in symptomatic AFD carriers seeking medical attention. Asymptomatic women were not investigated in this study, as the present health care policy does not recognise them as patients affected with AFD. The results of abnormal renal and cardiac function reported here are therefore underestimates. The median cumulative survival in 32 obligate carriers was 70 years, which represents an approximate reduction of 15 years from the general population. A gradual decline of the AFD female carrier curve is evident from the age of 35. These data suggest milder expression of the disease in AFD carriers than in affected males. A review of clinical manifestations in heterozygotes for AFD estimated the frequency of neuropathic pain as <10%.1The accumulation of sphingolipid was determined at necropsy in the spinal and sympathetic ganglia in a carrier with severe neuropathic pains and cardiomyopathy. A significant increase of 34- and 48-fold respectively above normal was found,5 thus explaining the likely aetiology of severe neuropathic pains. In this cohort, a substantially higher frequency of pain was evident and, as in AFD males, the mean onset of neuropathic pains in carriers was 15 years and in 20% the pain had stopped at the age of 28. The pain scores for both attacks and background pain in carriers were surprisingly high, >5, and suggest that these women require improved pain management. Only 17.1% of carriers were receiving anticonvulsants or opiates. High scores were obtained for the effects of pain on attendance at school, participation in sports, and the impact on family and social life. A third to half of respondents scored the impact of pain on their life as being high. Similarly to affected males, the duration of the neuropathic pain appears to be life long and stops in a small percentage of women. The frequency of cerebrovascular complications in carriers was estimated as <1%, occurring in rare female variants with 0-5% α-galactosidase activity.1 Neurological manifestations such as TIAs, CVA, tinnitus, severe hypostatic hypotension, and sensorineural hearing loss have been documented as case reports.6 A cohort study of 10 female heterozygotes with cerebrovascular complications reported the mean age of onset as 40.3 years and the signs and symptoms, in descending order of frequency, as: memory loss, dizziness, ataxia, hemiparesis, loss of consciousness, and hemisensory symptoms.7 In another study, the incidence of thrombotic accidents was 10% (n=15), where two carriers had CVA aged 43 and 49 respectively and one had central retinal artery thrombosis at 31.8 The incidence of TIA in carriers is unknown. In this cohort, a direct question was asked about past history of TIA and a high frequency was found (table 4). Several carriers in this group were in their 60s and 70s, when cerebrovascular events are common and not the result of AFD. However, the mean age for TIA at 52 years indicates that in the majority of these women the onset of TIA was early and most likely the result of AFD pathology. Results from this cohort suggest a higher frequency of cerebrovascular complications than previously reported. Two unrelated carriers in this cohort had mild idiopathic MR, and both have developed ESRF, aged 35 and 37; further investigations are ongoing (one of these was not included in this study because of failure to return the questionnaire). The incidence of renal failure in carriers was estimated as <1%, occurring in rare female variants with 0-5% α-galactosidase activity.1 Abnormal renal function, proteinuria, and ESRF were reported in several female carriers.1 Characteristic renal changes of AFD were also described in asymptomatic carriers with normal renal function, when investigated to become kidney donors for their male relatives.9 Two heterozygotes had a mosaic pattern of focal patchy AFD inclusions/degenerative changes among normal appearing glomeruli on electron microscopy.9 The Gb3 accumulation in the kidney was age related and Gb3 content in urine sediment of heterozygotes was increased up to 20-fold compared with normal.1 From these reports to date, we can conclude that probably all carriers accumulate Gb3 in the kidneys and usually at a much slower rate than AFD males. The rate of Gb3 deposition appears variable. In this cohort, two women (3.3%) developed ESRF at ages 35 and 37 respectively, and so far neither has had a renal transplant. In these two women, the age at onset was comparable to AFD males, but the frequency of ESRF was much lower in carriers than the 26% found in hemizygous males.10 The frequency of abnormal renal function in this cohort could not be determined because of lack of data. In this cohort, chest pain and palpitations were reported by 52.5%, but only a third were investigated. Four carriers had mitral valve replacement aged between 55 and 65 years. Gastrointestinal structure and function were investigated in 13 affected males and in 17 heterozygotes.16 Twenty-nine percent of heterozygotes were symptomatic and jejunal biopsy showed characteristic electron dense sphingolipid deposits situated in the neuronal and vascular tissue in the bowel submucosa. These lesions were not visible by light microscopy. The bowel involvement in carriers was less frequent than in males and less pronounced. The onset of symptoms was later than in males, at between 15-35 years, and several girls also had mild growth delay. In this cohort, 58.3% of carriers reported having GI symptoms, which included abdominal pain, diarrhoea, or constipation and vomiting. Most women had extensive GI and gynaecological investigations. None of the carriers in this cohort experienced GI complications in the form of bowel perforation or infarction and the severity of symptoms appeared to progress with age. In none of these women was the cause of GI symptoms identified. In this cohort, severe disabling fibromyalgia was diagnosed in five women aged between 45 and 55 years and one had proximal muscle atrophy. A similar presentation was described in an AFD male, who had characteristic sphingolipid deposits seen on muscle biopsy.20 Large joint pains were a frequent complaint of AFD carriers over the age of 50, but these were not formally assessed. 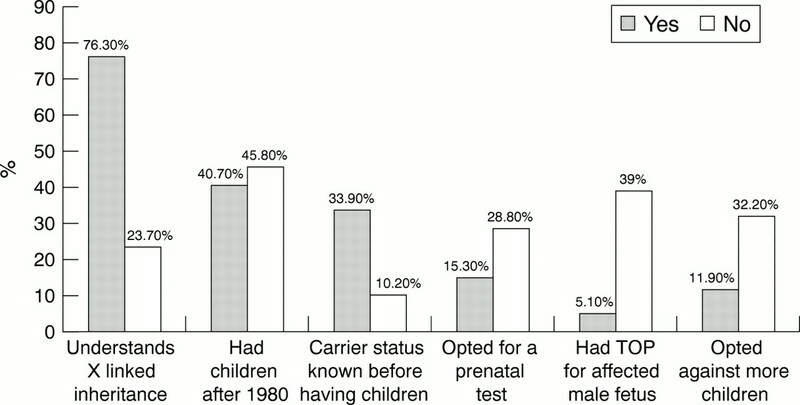 The majority of women understood X linked inheritance and their carrier status was known before pregnancy. Nearly half of women of childbearing age opted against having more children because of AFD. Prenatal diagnosis was used by only half of the women in this cohort, most likely reflecting the dilemma of termination of pregnancy for a disease with late onset of complications. In this study, obligate female carriers reported multiple AFD manifestations, with high frequency, which was not recognised previously. However, similar findings were recently reported, in cohorts of 12 and 21 female carriers.21 22 The progression of the disease is slower in carrier females, as would be expected in subjects with partial enzyme deficiency. The patchy distribution of cells with lipid deposition in cardiac, renal, and skin tissues confirms random X inactivation even in carriers with severe manifestations of AFD. We are grateful to the AFD patient support group, to the families for their cooperation and to Transkaryotic Therapies Inc, Boston, USA for financial support of AH. Professor B Winchester at the Enzyme and Molecular Genetics Laboratory, Institute of Child Health, London analysed most of the samples from this cohort. (1995) Fabry disease: alpha galactosidase A deficiency. in The metabolic and molecular bases of inherited disease. eds Scriver CH, Beaudet AL, Sly WS, Valle D (McGraw Hill, New York), pp 2741–2784. (1987) The short-form McGill Pain Questionnaire. Pain 30:191–197. (1990) Biochemical and clinical analysis of accumulated glycolipids in symptomatic heterozygotes of angiokeratoma corporis diffusum (Fabry's disease) in comparison with hemizygotes. J Lipid Res 31:335–340. (1978) Neurological manifestations of Fabry disease in female carriers. Ann Neurol 4:537–540. (1996) Cerebrovascular complications of Fabry's disease. Ann Neurol 40:8–17. (1997) High incidence of thrombosis in Fabry's disease. Intern Med 36:327–329. (1978) Early renal changes in hemizygous and heterozygous patients with Fabry's disease. Kidney Int 13:223–235. (2001) Anderson-Fabry disease: clinical manifestations and impact of disease in a cohort of 98 hemizygous males. J Med Genet 38:750–760. (1986) Cardiovascular manifestations in Fabry's disease. A high incidence of mitral valve prolapse in hemizygotes and heterozygotes. Clin Genet 29:276–283. (1996) Immunofluorescence analysis of trihexosylceramide accumulated in the hearts of variant hemizygotes and heterozygotes with Fabry disease. Am J Cardiol 78:116–117. (1988) Myocardial involvement in female Fabry's disease: evaluation by thallium-201 myocardial scintigraphy (in Japanese). J Cardiol 18:135–144. (1998) Cardiac transplantation for Fabry's disease. Can J Cardiol 14:81–84. (1981) Gastrointestinal structure and function in Fabry's disease. Am J Gastroenterol 76:246–251. (1987) The lines of Blaschko: a developmental pattern visualizing functional X-chromosome mosaicism. Curr Probl Dermatol 17:5–18. (1986) Fabry's disease. Rare etiology of a long-term inflammatory syndrome. Apropos of a case (in French). Rev Rhum Mal Osteo-Articulaires 53:525–528. (1993) Polyarteritis nodosa-like necrotizing vasculitis in Fabry disease. J Inherit Metab Dis 16:901–902. (1995) A histochemical and electron microscopic study of skeletal and cardiac muscle from a Fabry disease patient and carrier. Acta Neuropathol 90:334–338. Whybra C, Bunge S, Beck M. Clinical manifestation in female Fabry disease patients and molecular genetics carrier diagnosis (abstract). 5th International Symposium on Mucopolysaccharide and Related Diseases, Vienna, 1999..
Whybra C, Beck M. Neurological complications in female Fabry patients (abstract). 6th International Symposium on Mucopolysaccharide and Related Diseases, Minneapolis, 2000..